How will climate change influence the distribution of species? To answer this question, we need to know what controls range limits, and how those controls differ by species. Climate is thought to determine where species can survive given their physiological tolerances, with biotic interactions such as competition acting to further restrict those distributions. Despite the long acceptance of these ideas by ecologists, we still lack a complete understanding of the forces that constrain species’ distributions. First, few studies have quantified how both climate and competitive interactions affect species performance across ranges – key for assessing the relative importance of fundamental vs. realized niches. Second, most range limit studies ignore the possibility of historical legacies – when the distributions of long-lived and/or locally-dispersing species reflect past rather than current conditions. Finally, we generally lack the data and analytical approaches to estimate how rapidly species distributions will respond to changing conditions. Addressing these shortcomings is essential, given rapid rates of climate change that have already resulted in the upwards or polewards movement of many species, with continued range shifts expected. To explore these questions, we are combining observational monitoring, common garden experiments and statistical modeling to assess the controls over current and future altitudinal range limits of tree species on Mt. Rainier, Washington. Because Mt. Rainier covers large climatic gradients, it is an ideal natural laboratory for studying climate change and altitudinal range limits. Using field observations, experiments and statistical modeling, we are 1) determining what climatic factors limit performance at range limits, and how these vary among species; 2) assessing the relative importance of climate relative to other factors (e.g. competitive interactions, edaphic conditions); building population growth models (IPM's) to assess the net effects of climate change on population dynamics; and 4) revisiting legacy vegetation plots (censused in the late 70's) to determine how and whether overstory and understory plant communities have changed with recent warming. Ongoing data collection includes monitoring of tree growth, survival, seed production (4-30 years data), seed dispersal and microclimate (temperature, snow depth, soil moisture, date of meltout - 4 years data) in 18 stands located across Mt. Rainier National Park. These 18 stands are part of a large scale network of permanent vegetation plots located across the Pacific Northwest (established by Jerry Franklin and colleagues). We have also conducted several common garden experiments - planting seeds and seedlings at and beyond range limits to assess climatic controls on seedling recruitment. In addition to ongoing monitoring and experiments, we make use of extensive spatial data on the distribution of focal conifers (collected by the National Park Service in the early eighties and early nineties) and spatial climate models, allowing us to ask whether species current distributions on Mt. Rainier can be predicted by relationships between climate and population growth (from demographic measurements). Coniferous forests in the Pacific Northwest are among the most productive ecosystems in the continental U.S, provide valuable ecosystem services (water supply, timber, carbon sequestration), and are the home to many endangered species (e.g. the Northern Spotted Owl). Thus, understanding how climate change will affect this biome is critical. You'd be amazed at how hard it is to find resources to identify seedlings - check out our conifer germinant id booklet for Mt. 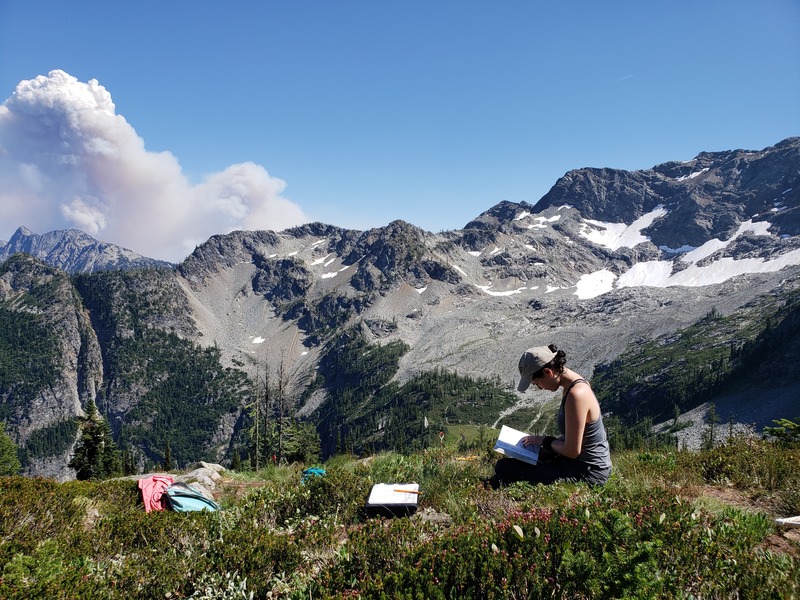 Rainier here and this awesome seedling guide for trees and other species in the North Cascades here (developed by Kyra Kaiser)! 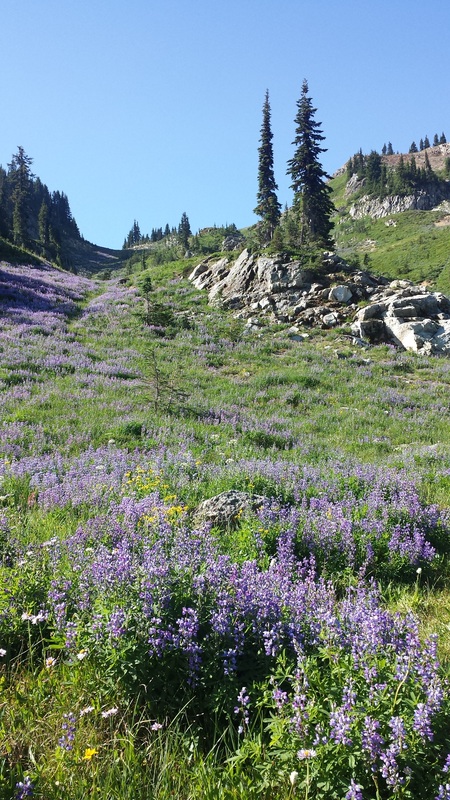 What controls the wildflower phenology in high mountain meadows? The timing of key life events like reproduction (i.e. phenology) is tightly linked to climate. For example, alpine wildflowers emerge and flower within a few weeks of snow disappearance, and complete their life-cycles before the frost in early autumn. Because annual variability in snow disappearance is large, the timing of seasonal wildflower displays also varies annually, influencing visitation and staffing needs within parks. Additionally, as climate change causes earlier snow disappearance, wildflowers that cannot shift their phenology to match this altered “climate window” may decline, as could other species (e.g. pollinators, bears) whose activities do not shift in concert with the plants whose pollen, nectar, seeds or berries they rely on. Thus, resource managers and conservation biologists are interested in understanding the link between climate and wildflower phenology, as well as in generating long-term annual records of wildflower phenology. In collaboration with Jessica Lundquist and graduate students Elli Theobald and Ian Breckheimer, we have used many approaches to understanding the impacts of climate change on snow dynamics (a strong driver of wildflower phenology in our system), the link between snowmelt influences and wildflower phenology, and the implications of earlier snowmelt and shifts in wildflower phenology for National Park visitation, pollinators, and patterns of co-flowering. Please check out our citizen science program MeadoWatch, launched in summer of 2013, for more details. How strongly does climate influence the composition of communities? If climate is the predominant force structuring communities, climate change should predictably result in the loss of cold-adapted species at the expense of warm-adapted species in local communities. Alternatively, if climate doesn’t strongly structure communities or microclimatic refugia buffer communities fromregional climate trends, community composition may not change much with climate change. However, apparent stasis in community structure with warming can also arise from the failure of component species to shift their ranges with warming, due to (for example) recruitment limitation or demographic inertia. Unfortunately, these two have very different implications; the first suggests communities may be somewhat resilient to climate change, while the latter implies community sensitivity, especially as climate change accelerates. To explore the potential for community resilience vs. sensitivity to recent and future climate change, myself and Amy Angert are resurveying plant community composition at >1000 plots first surveyed in the 70's / 80's to determine the extent to which plant communities have already responded to recent warming, and how local microclimate influences these responses. We are also conducting an extensive seed addition experiment. Are niches critical for the biodiversity of California's wildflowers? It’s safe to say that Steve Hubbell shook up the ecological world when he introduced community ecologists to the idea that diverse communities need not necessarily result from species that are niche differentiated, but may simply occur because speciation balances extinction over long time scales. Traditionally, community ecologists had focused their research on niches, those which lead to more negative intra-specific interactions than inter-specific interactions (e.g. resource niches, density-dependent natural enemies, storage effects). Such interactions provide species with an advantage when rare, thus buffering them from extinction when they are rare. Niche differences are critical for maintaining diversity when competitive differences among species are large (otherwise rapid competitive exclusion would occur). Given that highly diverse communities are the norm, ecological debate today centers on whether diversity results from strong niche differences overcoming large differences among species in competitive ability, or whether species are roughly equivalent in their competitive ability, requiring little (or no, in the special case of the neutral model) niche differences for diversity maintenance. I am collaborating with Jonathan Levine to experimentally determine the importance of niches for the coexistence of California serpentine annuals. We are quantifying the relationship between frequency and per-capita growth rates for ten serpentine annual plants in experimental gardens. This is key, because frequency-dependent negative population growth is the signature of all stabilizing niche processes. We are also calculating population growth rates in the absence of stabilization to predict the magnitude of competitive ability differences in the absence of niches. Finally, we are manipulating seed production to remove negative frequ ency dependence and compare diversity and extinction dynamics in finite stochastic communities in the presence and absence of niche differences. Although many theoretical and empirical studies demonstrate that particular diversity-promoting mechanisms operate in natural communities, few studies attempt to determine the importance of niches for maintaining diversity, and none (that we are aware of) have attempted an experimental approach. Results thus far indicate that without frequency-dependent processes (i.e. niches), diversity plummets and a single species would dominate our experiment within 20 years. I collaborate with Haldre Rogers, Josh Tewksbury, Ross Miller, and Amy Dunham on the Ecology of Bird Loss Project in Guam and the Mariana Islands. We are taking advantage of a conservation tragedy on Guam - the virtual elimination of the native avifauna due to the introduction of the Brown Tree Snake - to examine the effects birds have on forest dynamics. Please see the project website for the most up-to-date news and progress.